Perhaps not the sanest way to start a description of the East Kent Access Road Community Dig, but it is indeed over. For myself it was a month long experience of running a commercial excavation while being outnumbered, aided and assisted by extremely keen volunteer archaeologists. I am hugely relieved that everyone made it out alive. Considering that at least 15 mins at the start of each day was spent instructing all volunteers about the possible hazards such as ‘falling over’ and ‘sharp things’ and do remember to drink plenty, and in the event of an emergency the exits are at the front, middle and rear of the plane… oh, sorry, wrong induction. I do, though, now appreciate the ability to repeat a health and safety briefing and smile at the same time. No, in our month there was no need to stretcher anyone off and as my volunteers went from 8 to 80 in years I was impressed. I also had no need to issue any Mr Happy or Mr Bump plasters. My slightly authoritarian approach to health and safety aside, I think I can say that the overwhelming majority of volunteers thoroughly enjoyed themselves whether they came for only a day or in one case every day! I’d never envisaged my chosen career to be a good excuse for someone to not do DIY, to play hooky from work, or in one case, a corporate bonding excercise?! The first day was a little daunting as there was suddenly a group of eager looking faces all with absolutely no idea of what doing archaeology entailed… Hmm. I wasn’t sure that we ‘professionals’ would be able to instruct our volunteers, even if we do it all the time at work. None of us are trained teachers. Would we be able to remember what it was to learn archaeology? Well, I can say that all our volunteers did grasp what to do, instructions were followed, performances were checked, guidance and feedback were given and all in all it panned out fine. Better than fine: remarkable even. We started out nice and easy with trowelling… okay so actually it’s not so easy and, yes, it does make your wrists and hands ache, but then any physical activity that’s new needs some time for adjustment. It was a group activity and I have to say that I never envisaged that our volunteers would be so friendly and approachable, let alone form such good friendships between both volunteers themselves and staff archaeologists. Throughout our month we met such amazing people with fabulous tales and life experiences to share. It did indeed become a ‘Community’ dig. At the end of the three gruelling days of trowelling cleaning the round barrow we took the site photos and although the volunteers couldn’t come outside the area fenced off for the Community Excavation (because of Health and Safety!1), we took their cameras for them. I shall always remember using all manner of digital cameras and being impressed and then getting to Cheryl’s – no less impressive for being a disposable one; but I did have to step back quite far to get everything in! We did like to scare our volunteers occasionally… Some thought they would simply be pushing wheelbarrows for the ‘professionals’, or making the tea, but oh no. Depending on what stages of the archaeological process people reached, they were guided through it; taking photographs; drawing sections and plans to scale; writing context sheets describing the various soils and the ditch shapes; and we also spent time on finds recognition. Pottery everyone could spot, that was easy, but flint? Well, we had a lot of flint and a lot of brilliant explanations, mostly from our Nick Taylor, on ‘how to tell if it’s worked or natural’. A true test of archaeological ability, given that the site was strewn with naturally occurring flint! Flint was one of those sharp things I warned everyone about daily. There were also quiet moments when I could get everyone together to try valiantly to explain just why we use three cameras and the basics of archaeological photography, or even worse, to explain the essential principal of stratigraphy by analogy to a jam sandwich. I may have failed somewhat but just to remind all of you volunteers… the stuff at the bottom of the ditch should be earlier (older) than the stuff at the top, honestly! Our levelling to record heights above sea level was also a laugh, the secret being that Alex had to check with Gary what was added to what before starting out! It’s easy to forget when we have snazzy GPSs to do the same thing for the majority of the time, but I suspected that the inner working of Global Positioning Systems might be a bit ambitious for the volunteers – certainly so for some archaeologists! The thing that made me smile the most was seeing John our septuagenarian volunteer drawing a section on the special weatherproof graph paper, which is in metric…and of course for him imperial measuring comes more naturally! The best, most rewarding moments were when I’d catch someone doing a task absolutely correctly on their own after being shown what to do. I’ve been truly impressed by our volunteers’ willingness to tackle whatever we gave them; straightforward trowelling; small scale digging with trowels and hand shovels; mattocks (‘not to be swung over your head please’); shovelling; wheelbarrowing; recording; finds processing… not one person said they didn’t want to, or it was too hard. Nor was there ever any moments of ‘archaeological envy’ – nobody threw their toys out of the pram and demanded to be digging someone else’s part of the site. It is a harsh lesson for any archaeologist to learn that not everyone gets the wonderful features or amazing finds. Our heritage comes in all shapes and sizes, and all is equally important and deserves the same equal treatment and consideration. And being part of the team that achieves it is what matters, not really who found what. What we can say is that everyone excavated or washed genuine archaeology. Being on a chalk ridge used predominantly for the monumental burial of important Bronze Age people, some of it was 4000 years old! I think that helps to explain why, although ‘breaks will be at 11am and 1pm, for half an hour each’, the kettles were often nearly cold by the time everyone got to the huts, so keen were they carry on or to see what everyone else was finding or doing. Throughout the month we had numerous visits from all sorts of interested groups who’d taken up the opportunities to come and see the site and finds. Nearly 300 people came on organised visits and they ranged from young to old and were from all walks of life. All were welcomed. They have all borne witness to our activities and provided the final pages in the story of the site. For that’s one of the main jobs an archaeologist has to do, to tell the story of the people who were there in the past from the evidence which survives. Hopefully with more work to do in the labs and by the specialists this will be possible, although patience is required (another trait for our volunteers to discover). I would like to take this opportunity to thank, on behalf of the volunteers of who we had nearly 100 over the 4 weeks, my lovely staff. They were; Hannah Baxter, Paul Clarke, Gary Evans, Artur Fedorowicz, Alex Latham, Roberta Marziani, Rowan McAlley, and Nick Taylor. They were all excellent teachers, generous with the time and experiences that they freely shared. All of them remained cheerful throughout. It has not been easy to ask so much of them but they were brilliant. I’d also like to thank the volunteers, far too many to name all except for a small crowd of familiar faces which gave us constant help in a sea of ever changing people. So to Gavin Fox, Cheryl Cox, Les Moorman, Denise Hood and John Jarvis we thank you. To all the others, and indeed I know all your names, I commend your archaeological spirit and long may your interest which we have hopefully nursed, continue. You are as much the archaeologists of Kent as we are. Thank you. The recently completed Community Excavation was a run away success. The volunteers dig team had a great time and made a major contribution to the archaeology of the scheme. They were also treated every morning by the Holiday Inn Express at Minster to coffee and pastries before they started work, thus setting a new standard in fieldwork comfort. This kindness was part of the Inn’s support for the archaeology community programme. 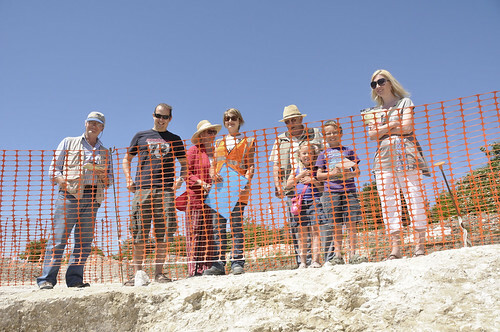 The support included providing parking and safe access to site for the first open days, showcasing an exhibition, and hosting a lunchtime event for community leaders before a visit to the excavations. ‘Come and see history being uncovered for yourself. Or wait for months to see it on TV.’ That’s what David Crawford White, the archaeology outreach officer for the country’s biggest archaeological dig is saying. There will be the opportunity to visit the excavation of an Iron Age village near Ebbsfleet that dates back almost 2,000 years. The objects found at the site show that the village was occupied in the years leading up to the landing of the Roman army at Richborough. As well as free guided tours of the excavation where the remains of the Iron Age houses can be seen, there will be displays and the chance to meet the archaeologists making the discoveries. Family activities include digging for and identifying finds, and making pots. 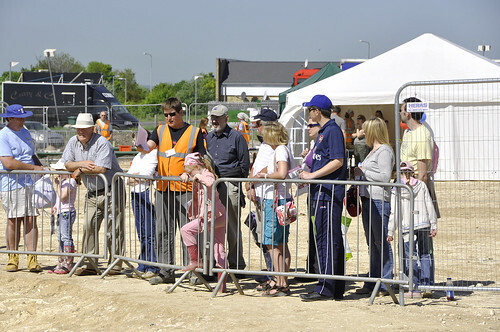 The open days are being held at the site office for the road scheme and a free shuttle bus service will run between the office and the excavation. If you plan to take the guided tour please wear stout shoes as the ground is uneven and may be muddy. Experts from the Trust for Thanet Archaeology, the Isle of Thanet Archaeological Society, Kent Archaeological Society and the Cotton-Powell Museum will be on hand to give advice and information. By road: the offices are off the southbound carriageway of the A256, just south of the power station. The offices are clearly signposted. Bus: Saturday only: Stagecoach East Kent Nos 88/88a. Get off at the Richborough Pfizer Social Club. The site office is approximately 300m further south towards Sandwich on the A256. There is no bus service on Sunday. It was like the first day at school, exacerbated by the letter of acceptance which also listed what to bring, and what was strictly not allowed. So leaving my iPod at home, I reported for duty on the Monday morning, having met my fellow volunteers in the nearby hotel, over coffee. Vix, the archaeologist in charge of our section of the dig, area 23, gave us the outline of the weeks work, and the all important safety briefing. Then armed with a bucket, containing a pointing trowel, a brush, and a shovel we made our way out to the dig. It was a round barrow, a burial mound from the early Bronze Age, or earlier. The top soil had been removed. We had to “clean” the area, with our trowels, removing another fifteen centimetre’s or so of earth. With a small pointing trowel! In total there were twenty of us, but just eight volunteers. That first day we were all eager little beavers, the volunteers that is, and went at our task with a will. I worked all day, and found nothing, well I found quite a few things, but none that passed the Alex test. The next day I woke early, my muscles ached, but pulled on my steel toe cap boots, and headed for the dig. It was even colder than the day before. As lunch approached we were almost halfway across the barrow. We were taking it a little easier. Alex shook her head as I presented yet another piece of flint. We progressed, slowly but surely. Millimetre, by millimetre, on hands and knees. Wednesday, a little warmer, we resumed cleaning the barrow. It was a painfully slow process, but we kept at it. After mid morning coffee I handed Alex a small piece of flint. She nodded, and smiled, “that’s a nice specimen, better bag it.” At last I’d managed to find something. A small Early Bronze Age tool. Yes! During the next half hour I found five more. This was a good morning, it was warmer, I was working at a pace at which I could continue all day. Later that afternoon we finished the clean, and stood around the perimeter for a group photo. I was covered in chalk dust, and was filthy dirty when I arrived home to my wife later that afternoon, a happy but knackered volunteer digger. Still with the rest of the week, and all of the following to come.